The Mac Plus (and associated machines) have 1MB of contiguous address space around the ROM, starting at $400000 through $4FFFFF. However, the Plus ROM is only 128K in size. 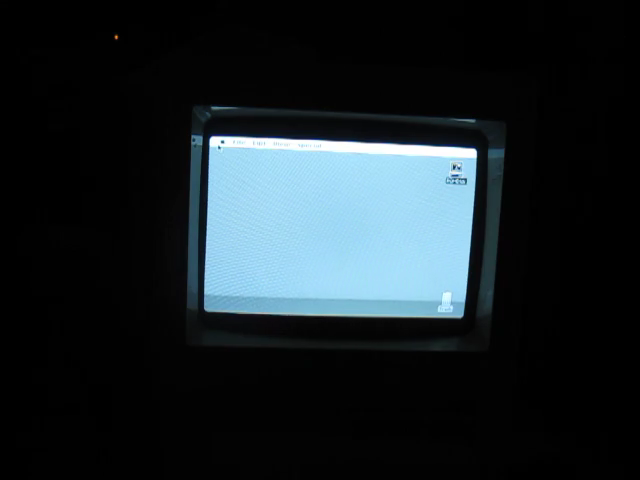 This project is for an adapter to allow a full 1MB ROM plugged into the Mac Plus, and a modified ROM image to utilize the extra space as a ROM disk. This project adapts two 29F040 32pin DIP flash ROMs to the Plus rom sockets. The 29F040 has a capacity of 512KB, for a total of 1MB. The Plus data bus is 16bits wide, with each of the 2 ROMs providing 8bits. Since each ROM is only providing every other byte, the processor's address lines are shifted up by 1 bit relative to the ROM's address lines. That is to say, A0 on the ROM is the processor's A1, all the way through the ROM's A15 is the processor's A16. 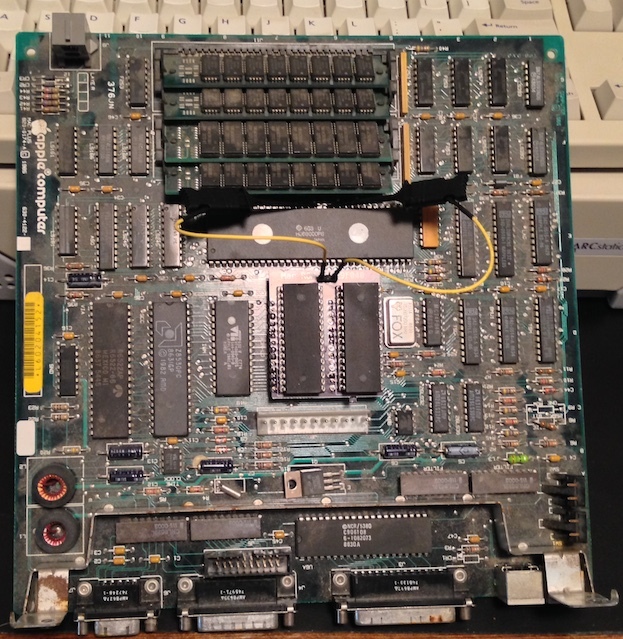 Since the processor's A17 goes to pin 22 of the ROM sockets, which this adapter board can wire to the 29F040's A16, that only leaves 2 address lines unaccounted for, to get the full 1MB addressed. This adapter brings those 2 extra address lines out to a header, which is then manually connected to the processor's A18 and A19 pins. In this case, I am using test clips to simply clip to those pins on the processor. 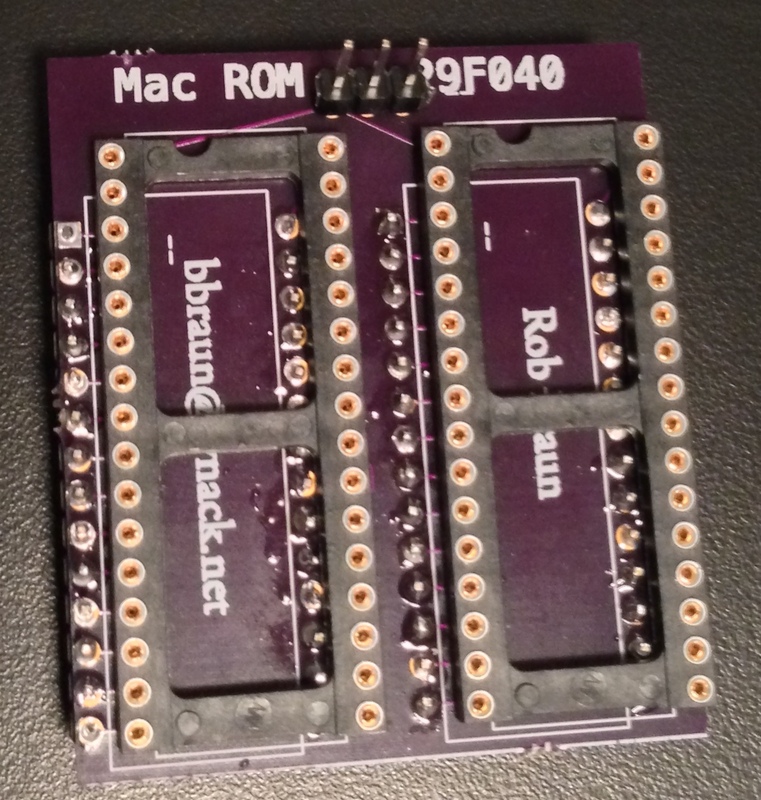 The ROM modification is based on the ROM disk driver I wrote for dougg3's Mac ROM SIMM. There have been a few changes and improvements to the driver for this project. In addition to the driver, the ROM its self needs to be modified to add the driver and make sure it gets loaded. $400000 - $41FFFF - The modified Plus ROM. $420000 - $427FFF - ROM Disk driver and whatever else. $428000 - $4FFFFF - ROM Disk image (884736 bytes). This gives a ~850KB disk image, and more than enough space for future code expansion. 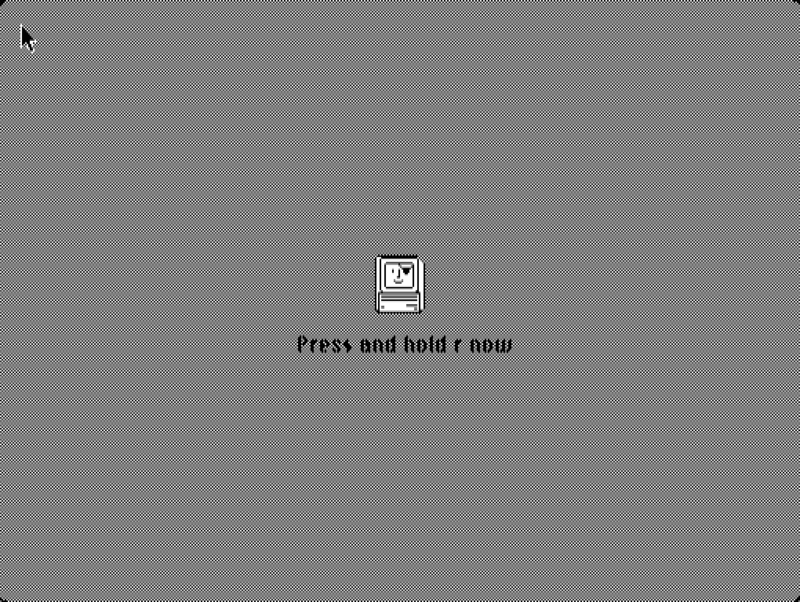 One of the changes I made to the ROM disk driver from the ROM SIMM Driver is displaying a message at boot telling you to hold down 'r' if you want to boot from ROM, and a modified happy mac icon indicating the ROM disk is being used. modplus.bin Modified ROM with driver. Concatenate a disk image to the end of this for a usable ROM. split.c A .c program to split the final ROM image into even and odd chunks for programming into flash. macplus.rom Modified ROM without the driver. This ROM probably won't be of much use without the driver. ROMDisk The ROM disk DRVR resource.